Join us for a morning, afternoon or full day guided sea kayak fishing trip with one of our BCU qualified instructors and try out our fishing kayaks with a professional who is familiar with the area. Whether you are a beginner or experienced angler, we promise to give you a memorable experience. 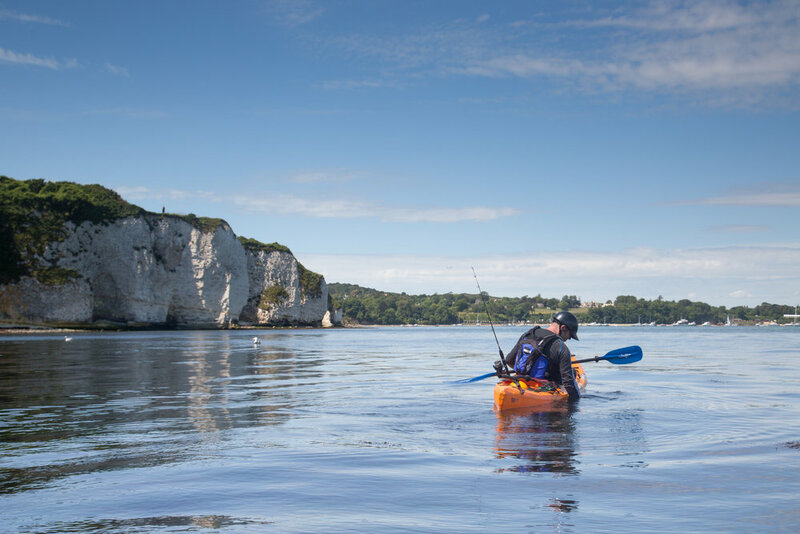 We offer kayak fishing courses and experiences in Studland, Dorset. Bespoke options are also available for groups or individuals and are priced according to group size and the scope of your adventure imagination - give us a bell for more information. The session would commence with a safety briefing and introduction to the equipment and kayaks, followed by a trip to the best kayak fishing locations in Studland. Depending on the time duration and conditions on the day we explore the North end of Studland Beach close to the mouth of Poole Harbour and beyond, or to the far Eastern tip to Old Harry's Rocks and around to Swanage. We manage our sea kayak fishing sessions responsibly in a sustainable manner. Fishing from a kayak is an ecology-friendly activity with minimal impact on the environment. You can catch Bream, Bass, Mackerel, Rays, Dogfish in the Summer and Whiting and Plaice in the Winter..
Our beautiful location in Studland, a stunning secluded sandy peninsula in Dorset is just a short drive away from Bournemouth, Poole and Swanage. From here we take to the seas from our base on Middle beach to explore the sunny bay with Old Harry Rocks as our backdrop to explore the famous stacks and arches. Safety is our number one priority and we can guarantee that all our instructors are trained to industry standard best practice and hold National Governing body qualifications where applicable, to operate in line with our AALA licence for coasteering and kayaking. As a WISE wildlife safe accredited operator you can rest assured that we work responsibly, kayaks are quiet and unobtrusive affording anglers to get up close to sealife and wildlife. We have heaps of adventures on offer in Dorset. Kayaking, foraging, fishing, feasting, bushcraft and more...take a look and make a full day of it. These special events run monthly and include a water based adventure forgaing and fishing out to Old Harry Rocks followed by a handcrafted feast by the seashore. You will be taught how to harvest and prepare wild edibles and get stuck in learning how to prep the fish or seafood for the feast. See our kayak foraging page for more details. Hop on over to our events page to see what we've got scheduled this year. Read what our customers love about our kayak fishing courses in Dorset! !